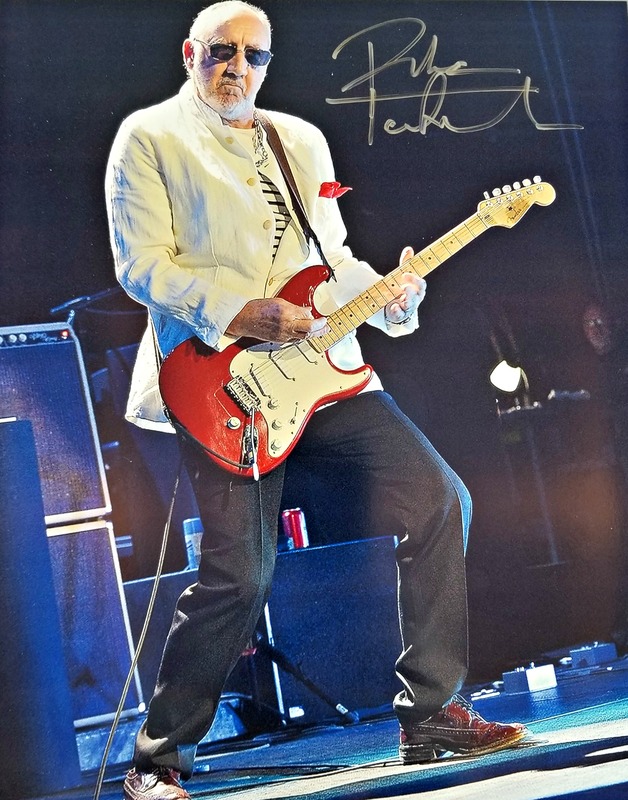 This 8″x10″ color photo comes signed by the English musician and main songwriter for the rock band The Who, Pete Townshend. The photo includes a letter of authenticity form Memorabilia Center. Peter Dennis Blandford Townshend (born 19 May 1945) is an English musician, singer, songwriter, and multi-instrumentalist, best known as the lead guitarist, backing vocalist, and main songwriter for the rock band the Who. His career with the Who spans over 50 years, during which time the band grew to be considered one of the most influential bands of the 20th century. Townshend is the main songwriter for the Who, having written well over 100 songs for the band’s 11 studio albums, including concept albums and the rock operas Tommy and Quadrophenia, plus popular rock radio staples such as Who’s Next, and dozens more that appeared as non-album singles, bonus tracks on reissues, and tracks on rarities compilations such as Odds & Sods (1974). He has also written more than 100 songs that have appeared on his solo albums, as well as radio jingles and television theme songs. Although known primarily as a guitarist, he also plays keyboards, banjo, accordion, harmonica, ukulele, mandolin, violin, synthesizer, bass guitar, and drums, on his own solo albums, several Who albums and as a guest contributor to an array of other artists’ recordings. Pete is self-taught on all of the instruments he plays and has never had any formal training. Townshend has also contributed to and authored many newspaper and magazine articles, book reviews, essays, books, and scripts, and he has collaborated as a lyricist and composer for many other musical acts. Due to his aggressive playing style and innovative songwriting techniques, Townshend’s works with the Who and in other projects have earned him critical acclaim. He was ranked No. 3 in Dave Marsh’s list of Best Guitarists in The New Book of Rock Lists, No. 10 in Gibson.com’s list of the top 50 guitarists, and No. 10 again in Rolling Stone magazine’s updated 2011 list of the 100 greatest guitarists of all time. In 1983, Townshend received the Brit Award for Lifetime Achievement, in 1990 was inducted into the Rock and Roll Hall of Fame as a member of the Who, in 2001 received a Grammy Lifetime Achievement Award as a member of the Who, and in 2008 received Kennedy Center Honors. He and Daltrey received The George and Ira Gershwin Award for Lifetime Musical Achievement at UCLA on 21 May 2016.